Located in the compound of the old Sir William Wanless Chest Hospital, Sangli is a large workshop lined with rows of small and complicated weaving looms that clack rhythmically and very fast as the women weavers work. They are all people from a nearby leprosy colony who have been trained and employed for many years in the center making shoulder bags, table mats and runners for export to Fair Trade Buyers all around the world. MESH is their main buyer and has been buying from them for more than twenty five years and exporting around the world. Primary sales are to MESH for export. 1. Capacity building programmes include Fair Trade training sessions conducted at least annually by MESH during field visits. The hand woven cotton place mats and napkins are the chief product purchased by MESH in bulk for export, especially to the U.S.A.
P.H.T.&R.C. shoulder bags are sturdy and long lasting. They sell well on the local market as do their hand woven cotton floor cloths. The table linen and bags are distinctive in that they are woven with mercerized cotton giving them a slight lustre. 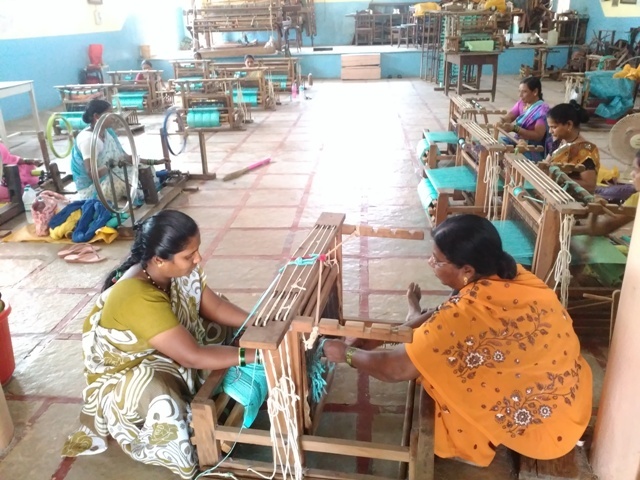 The yarn is purchased in a city about 300 KM from Sangli, is sent by transport to another place for mercerizing and then another for dyeing before it reaches if the rehab center. The ready yarn is then wound onto tins for warping onto the small table-looms and hand-held shuttles. The looms have three shafts all operated by smooth, shiny levers on the side. You can see a very popular place mat on our website here. And the cotton shoulder bags here. You can read about Savitri here.